Three Rehoboth farms and one Attleboro business have received state grants for conservation measures. The businesses, including an organic farm business in Attleboro, will take steps to prevent or mitigate impacts on water and air quality and ensure efficient use of water, according to the grants award announcement. The grants were among 23 totaling $300,000 to farmers announced by the Baker administration and the Massachusetts Department of Agricultural Resources. Through MDAR’s Agricultural Environmental Enhancement Program, funding is being provided to farms for various projects, including the installation of automated irrigation systems and water recovery for cranberry operations, and fencing. * 2 Friends Farm, Attleboro, $20,000 for ebb and flow benches. * DeSousa and Sons Dairy Farm, Rehoboth, $15,000 for manure storage. "A vibrant agricultural community in Massachusetts is essential to building healthy communities and a stronger economy across the Commonwealth,” Gov. Charlie Baker said. “These grants help Commonwealth farmers improve their bottom line and become more competitive while also improving the environment." 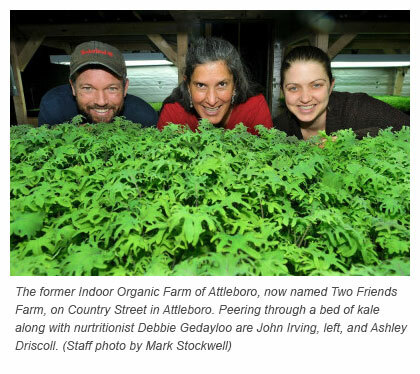 2 Friends Farm is an indoor, organic farming business in Attleboro. "Over the past two years, 2 Friends Farm has been at the forefront of redefining the agricultural community in Attleboro,” said state Sen. Richard Ross, R-Wrentham. “I thank the Baker-Polito Administration for this critical funding that will go a long way to support this flourishing local business and encourage responsible farming practices that are environmentally friendly and preserve our state’s resources." Selected farmers are reimbursed for the approved costs of materials and labor up to $25,000.